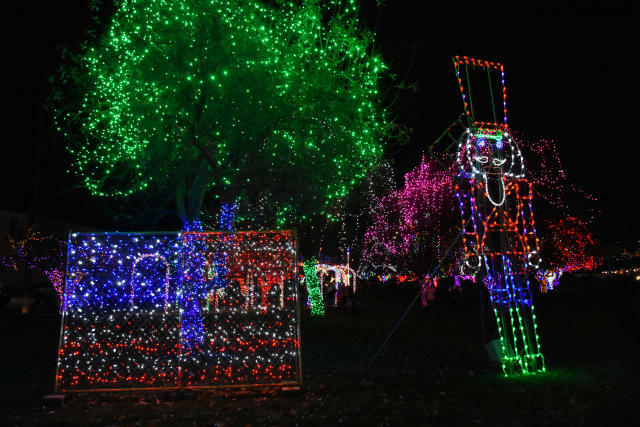 The holidays are here, and that means the world is filled with light displays! How I love this time of year! While on assignment for Northwest Travel & Life Magazine I got to experience the lighting ceremony for Winter Spirit in Lewiston, Idaho. What is Winter Spirit? 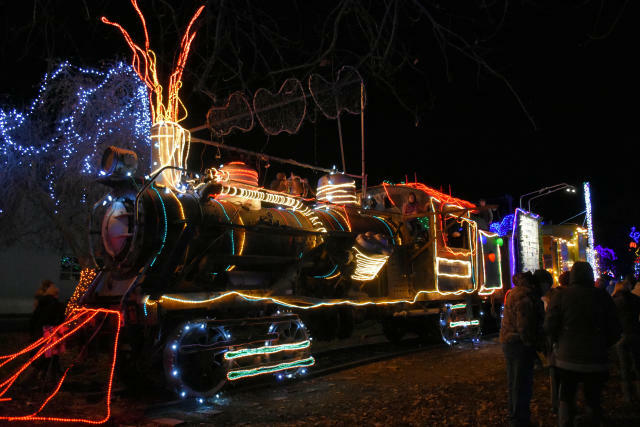 It is a festive light display in Locomotive Park in near downtown Lewiston. There are over a million lights (I’m not joking) and Winter Spirit starts the Saturday before Thanksgiving and runs through January 1. It’s free. It’s family-friendly. There is a train with a bell kids can ring. And, on weekends vendors that sell goodies like cookies, hot cocoa, and popcorn balls. The best way to experience Winter Spirit is to take a leisurely stroll through the park. When you get chilly, warm up next to the fireplace and watch the musical tree. If you are visiting with kids, they will love the light-up dance floor and ringing the train bell. Travel Tip: If you want to be there for the lighting ceremony it happens the Saturday before Thanksgiving. 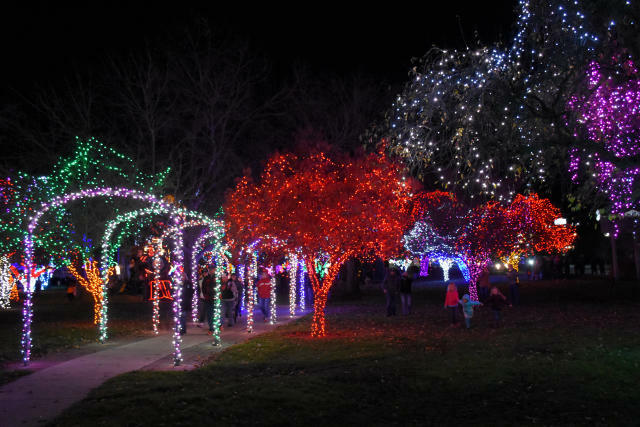 Festivities start at 4:15 pm and the park lights up at 6 pm. Be sure to dress for the weather! After our Winter Spirit stroll, we ventured over to Jollymore’s. (Now that I think about it, that name is rather Christmasy, isn’t it?) Jollymore’s is a 10-minute walk from Locomotive Park. If you have kids with you, they do have a kids menu with items like peanut butter & jelly, Cougar Gold man n’ cheese, and small burgers. Prices range from $5 to $8. Our table ordered a wide selection of items. 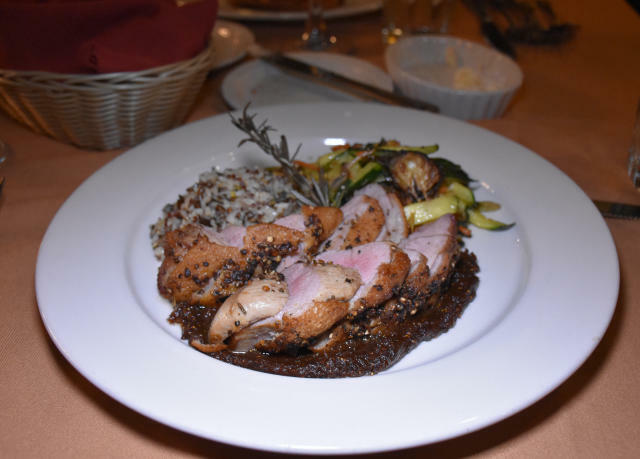 I had the roasted duck with Walla Walla sweet onions, fig jam, and a wild rice quinoa mix ($29). My duck was cooked to perfection, and with the fig, I was in heaven. 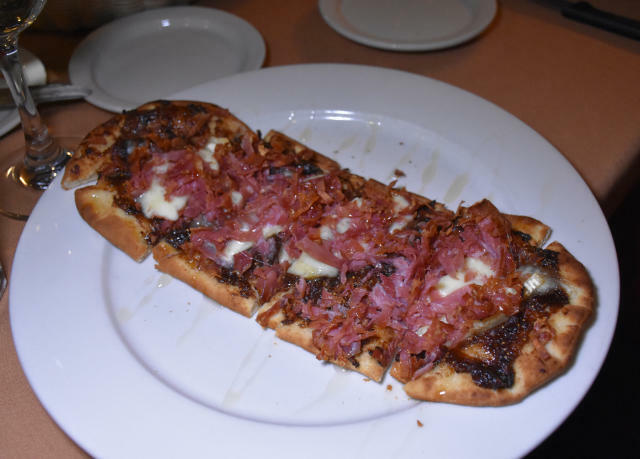 Another had the prosciutto and fig pizza with caramelized onions, brie, and local honey ($9). 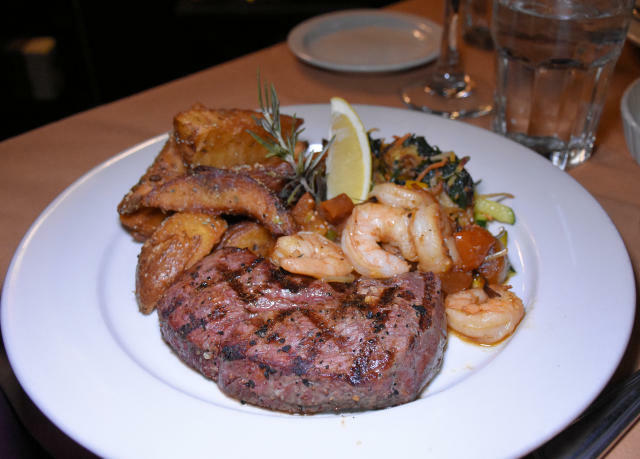 And, the steak special with shrimp, fall vegetables and rustic potatoes ($28). Desserts are chosen off their fresh dessert tray. We ordered the layered chocolate mousse cake and pumpkin spice cookies topped with vanilla ice cream and caramel. I loved the pumpkin cookie dessert, as I’m a huge fan of pumpkin and cloves and cinnamon. I liked the cake too, and appreciated that it wasn’t dense, but light with layers of mousse in between layers of cake. Overall, the service and food were excellent, and I would recommend Jollymore’s. Travel Tip: A very savvy local in the know told me that Monday thru Friday from 11 am to 5 pm Jollymore’s has $5 lunch specials. If you want to stay within walking distance of Winter Spirit stay at the Red Lion Hotel Lewiston or the Inn America Lewiston. You can see both of these hotels from Locomotive Park where Winter Spirit is held. 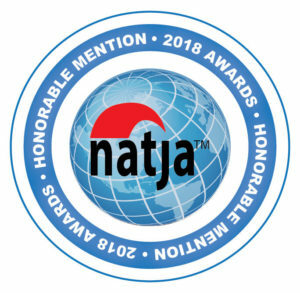 During my visit, I stayed in Clarkston at the Quality Inn & Suites, which a short drive away (read about my hotel experience). Some of the highlights are a made-to-order breakfast, a seasonal pool, year-round hot tub, a riverfront trail, and rooms with views of the Snake River. Lewiston is part of the Lewis Clark Valley and is known for its milder climate. There are plenty of activities like wine tastings, Hells Canyon tours in the summer, outdoor recreational opportunities and lots of history and culture with the neighboring Nez Perce tribe and historic points from Lewis & Clark Expedition. For more information on Lewiston and Clarkston visit the Lewis Clark Valley website. 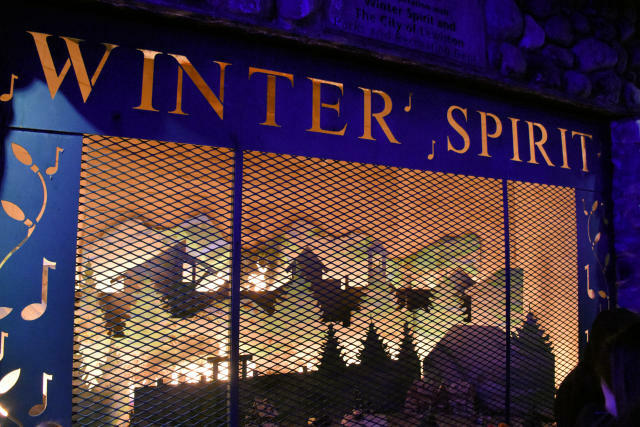 For more information on Winter Spirit visit their website. 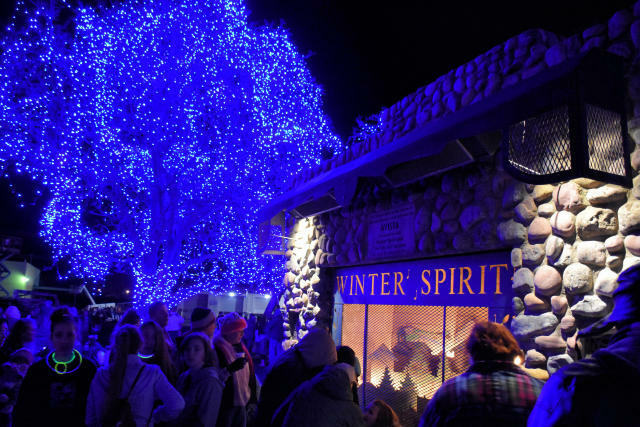 Have you been to Winter Spirit in Lewiston, Idaho? Oh my gosh! I wish we could make it over there but we’re booked solid through the New Year. My kids would love this even more than me. Rob, they would totally love it! Next year! Lights just make the holiday so pretty ! Oh just wow the lights are so gorgeous! I saw the lights festival in Beijing for their New Year,reminds me of that a bit…minus xmas theme ha ha. Yowza, look at all those lights! How very festive. And I think it would be great fun for kids! First, I wouldn’t think of Idaho as a great winter destination. However, I’m clearly mistaken. 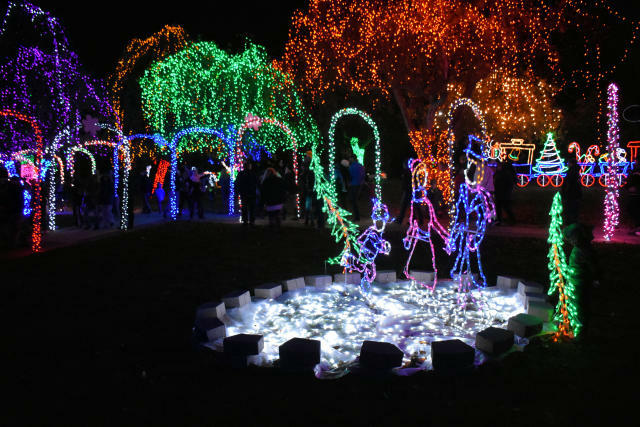 Winter Spirit in Lewiston looks phenomenal (a million lights, whoa!) and I think it sounds like a great place to take kids. Even thought I’d prefer to stay in Lewiston (and walking distance to the Winter Spirit site), the hotel where you stayed sounds excellent (and the view is incredible). Year-round hot tub, oh my! Natalie, Winter Spirit is very family-friendly and I think if you have family staying close is the way to go as you can walk there, and if you get a room facing Locomotive Park you could see the lights. Idaho is a HUGE winter destination for winter sports, so if those are things your family likes to do, you might want to check it out. Wow, the lights make everything look so magical. There are so many of them! Usually I find that there aren’t quite so many on each tree, but these make the entire tree look like it is made of glittering lights as opposed to just some lights strung around a tree. Gorgeous and really captures the winter spirit. Food looks delicious too. What a festive Christmas lights display! Our family adores seeing the lights this time of year — the more the merrier! Not sure when we might be up in the Lewiston area, but I’ll bet this is pretty popular! What a darling little city! I’ll be visiting Idaho in 2018 to get in my 50 before 50 bucket list. I like the choice of accommodations, too. The holiday lights look like so much fun!! It looks so festive with all the colour lights! It really put you in the holiday mood. We have something similar here in Calgary too!